Eccentric, bombastic, athletic and perhaps even pathetic are some of the words one could use to describe a man who had a profound effect on the lives of the people of New Bradwell in the early part of the last century. 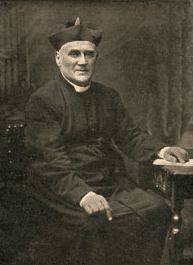 Father Allan Newman Guest became the Vicar of Stantonbury on 25th September 1908 and immediately set about challenging the established order. Below is an extract from a local history project, within the archive, of the early impact made by Father Guest. On March 27, 1909 he announced that all marriages at St James were illegal and the people of New Bradwell were living in sin. He announced during the course of his sermon that no licence had ever been issued to solemnize marriages at the church which had been built 50 years ago. He then stopped marriage ceremonies being performed until an order had been made legalising the marriages. The announcement came as a thunderbolt to a very full congregation, and it was estimated that 1000 marriages had taken place over the 50 years. Steps though were taken to legalise the marriages by an order from the Ecclesiastical Commissioners or in the last resort by the passing of a special act of parliament. On June 4th 1909 a bill was presented in parliament to make valid the weddings solemnized at the Church of St James, New Bradwell, and on July 16th the bill was presented to the examiner of the House of Lords for confirmation. Father Guest continued to preach to ever dwindling congregations but nevertheless was still a prominent figure in the community. He would often be seen running, vaulting gates and riding his bicycle with his feet up on the handlebars. He also immersed himself in his great love, music and would play well into the night to deliberately, some felt, disturb the locals. He died at a Bedford nursing home only two months after leaving New Bradwell on 6th December 1946.